However it’s somewhat confusing as the group policy that controls this option has a totally different name called “Prevent the configuration of new tab creation”. 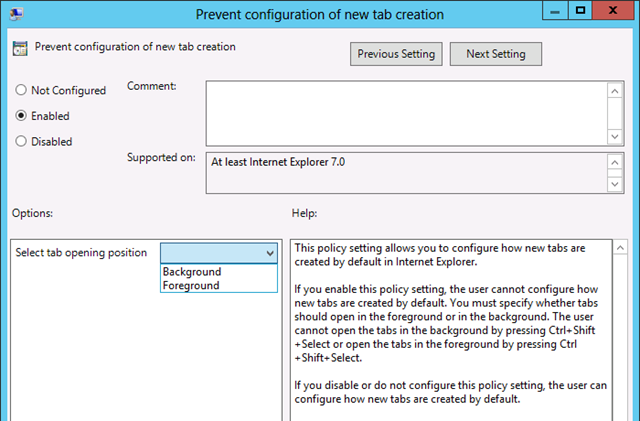 Just to make it more confusing this policy can also be know as “Turn off configuration of default behaviour of new tab creation” depending on the version of ADMX/ADML files you are running in your environment. 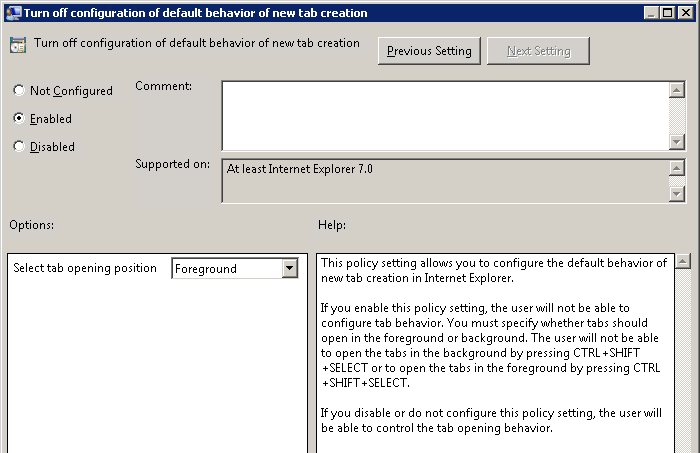 Having policies that have multiple names depending is somewhat common as this is dependent on the version of ADMX/ADML files you have deployed. This is another advantage of using a Central Store for you ADMX/ADML files as it means that the names of the Group Policy will be consistent in your organisation. TIP: But if you are trying to find a setting that you knew existed before but might have changed name the best place to start looking is in the original location in the GPO as this does not normally change. Another example of a Group Policy Object being renamed based on the version of ADMX/ADML files that you have deployed in your environment (e.g. “Verbose vs normal status messages” is now called Display highly detailed status messages). But rest assure that the is only a cosmetic change that that you will find that the actual settings and its configured values are still the same. Hotmail Sign up If you are not aware of how you can create a Hotmail account or we can say a new Outlook account, then here we have prepared a detailed tutorial with proper Screenshots and steps. You just need to follow each of the below-given steps wisely on your computer and at the end, you will have your own Outlook’s account. We would also guide you to sign in to your Outlook’s account or Hotmail login.